Knowing how to knit a picot hem is a good technique to learn. Usually, at the bottom of a garment you will have a ribbed edge. A picot hem, as pictured below, is a nice alternative. It's quite easy and here's how to do it. Start by casting on the number of stitches you need for your project. 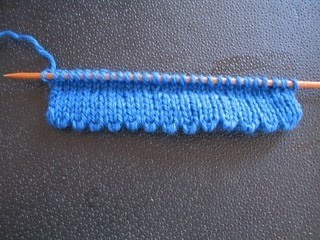 Knit 5 rows in stockinette stitch (K one row, purl back). End with a K row. These 5 rows will be the rows that you will turn under. With the wrong (purl) side of the work facing you, knit 1, YO, knit 2 together, to the end of the row. You will have knitted a series of "holes" but still have the same amount of stitches on the needle as you started with. Knit the next rows to match. With the right (knit) side of the work facing you, turn the picot edge under. You can do this (sewing) after you have finished knitting your project. You can change to any pattern stitch once you have made the picot hem rows. A picot hem gives a nice lacy looking edge which will stay flat and not curl up. Also, having the extra few stitches that turn under add weight, which keeps the edge in place without curling up. I have steered away from using picot edges because the one and only time I tried doing one, it didn't come out pretty at all. As a visual learner, the written instructions I'd followed didn't paint a clear picture for me. Thanks to your video, I have complete confidence I can now do what looks truly easy. Thank you! Thank you for letting me know this helped you. Try it, it's easy. I'm very like Renna -- the videos help me so much, though I need both visual and written, so your posts work perfectly for me, Judy, especially as I am a very new knitter.